WordPress is the most used CMS (content management system) on the internet. It is known for ease of use, wide array of plugins and extensions, themes and community support. Users prefer it to develop a simple blog or big corporate websites. Any website or blog could be built using this fantastic CMS. WordPress could be hosted on an own server (leased) or on wordpress.com (hosted version). Most users switch over to self-hosted wp instances at some point of time. Self-hosted wp bring its advantages as well as disadvantages. Today we shall discuss easy ways or steps to optimize your WordPress website or blog load time, maximize the speed or performance on any web hosting. First of all, you need to understand that WordPress could be made optimal and several methods could improve speed. We will discuss each and every process and ensure that we covered all possible ways by the end of the post. WordPress have different plugins to improve the speed. We shall list only the most essential plugins that will address the following issues. WordPress have a lot of dependency on the database. By default, each page or post will have revisions and versions. It will increase as you post more articles or build more pages. To keep your revisions, auto drafts, transient options, meta and other parameters under control. There are two excellent plugins. WP Sweep: It has over 40k active installs and it works flawlessly. The plugin helps you keep your database size in an optimal manner. We use it in all our projects. Once it is installed, you can see a new option in Tools menu in your wp dashboard. It has the following sections to sweep or clean the particular category or you can use sweep all to clean up every section at once. In our day to day use, we found this plugin very useful. It is easy for non-technical people and it does its job well. WP Sweep is an essential DB Optimization plugin that every wp user should install. It has small memory footprint and does not interfere with any other plugins. You can download wp sweep plugin here: https://wordpress.org/plugins/wp-sweep/ or you can search for “wp sweep” from your plugins area inside your WordPress and install it. WP Optimize: It has over 60k active installs and it works well. The plugin is developed by updatedraft team and it is recently updated after a gap of around 8 months. We have previously used this plugin and worked right. It works the same way as wp sweep. In addition to cleaning up database junk, it integrates with the updatedraft backup plugin. It helps you load the pre-optimized backup database, in case you need it. If you like updatedraft plus plugin, you may like to install this due to additional advantage of interlinking between two plugins. You can download wp optimize plugin here: https://wordpress.org/plugins/wp-optimize/ or you can search for “wp optimize” from your plugins area inside your wp and install it. Now that we have database optimization plugins in place let us move ahead and look at image optimization plugins. Images are major elements that slow down your wp blog or site. Image optimization will not only save your bandwidth and space but also improves your website load times. It improves user experience and makes sure that your site is faster on all devices. If we look at plugins for images optimization, there are too many in the wp plugin directory. We have tested most of them and found only 1 plugin that we can recommend which does not eat your web hosting resources. WP Smush: It is an excellent plugin that optimized images that are already uploaded as well as new uploads on the fly. It also optimizes other directories located in same plugin installation domain, if you need its help. WP Smush is low memory consumer, and when it is idle, it does not consume CPU or ram. We have tested lots of plugins int he past, and they either consumed too much ram or does not worked efficiently. WP smush it is a free plugin, and it has paid version as well. The free version does the job very well. You can download wp smush from here: https://wordpress.org/plugins/wp-smushit/ or you can search for “wp smush” in WordPress plugin dashboard area and install it. Now, we have solved image optimization issue to improve wp speed. The next step is to choose a caching and compression plugin that helps you improve your site. There are three plugins in the WordPress plugin directory, which we like and tested many times. W3TC (W3 Total Cache): It is a powerful plugin, which helps beginners, intermediates and advanced users to make their wp instances faster than ever. W3TC is a plugin that is tested, stable and easy to implement. The basic configuration works on most hosts and if you are an advanced user you can apply, CDN, Redis, Fragment Cache, and much more with the help of this plugin. It takes some time to understand what options work for your hosting, but your efforts will pay off. So install this plugin and tweak your wp instance to maximum performance. It is the most used plugin by wp optimized hosting companies and many big players approved this plugin for its stability and quality. W3tc is compatible with other plugins, and most themes are tested to work with it, without any issues. You can download it here: https://wordpress.org/plugins/w3-total-cache or you can find it in recommended or popular plugins in your wp plugin installation dashboard. Organize Scripts to load async or defer to optimize loading times. Although w3tc alone achieves most optimization part itself. You need to install Autoptimize plugin to make your website reach 100/100 score in Google page speed insights. Autoptimize: It is a little plugin, that works and solves some unresolved speed issues not addressed by the free version of w3tc. Autoptimize helps you fix above the fold content issues, defer the inline scripts. Aggregates multiple CSS and JS files into a single file or request. Autoptimize is compatible with w3tc and if both of them are installed and properly configured. You will observe a significant speed improvement. It can make you score 100/100 in Google page speed test. If you are someone who is behind speed / optimizing your wp instance to the maximum extent, you will love the combination of w3tc and autoptimize. The author of this plugin has youtube videos as well to help you understand and use both the plugins in the best way possible. We recommend to pair up it with W3TC, if you want to squeeze the maximum benefits of speed optimization using plugins. Download it here: https://wordpress.org/plugins/autoptimize/ or you can search for “Autoptimize” in wp plugin installation area in your wp and install it. We highly recommend W3TC for most users. However some users host their blogs or websites on hosting providers like Godaddy, for such users w3tc plugin may not work properly. The worst part is, these users does not care to listen if someone tells them that Godaddy hosting is not compatible to run WP in an optimal way. If you are using Godaddy and w3tc is failing to work for you, then there is 1 alternative plugin. It is called super cache. WP Super Cache: It is the only plugin known to work with worse hosting companies out there with no PHP modules or an old version of PHP with no caching extensions enabled to make most out of the host. If you use windows based hosting or Godaddy hosting without CPanel or with Cpanel, but old PHP version. WP Super cache is for your rescue. You can download super cache plugin here: https://wordpress.org/plugins/wp-super-cache/ or search for “super cache” or you can find it in popular plugins area. We obviously do not like this plugin due to its limitations and some bugs, but when you have no option to improve your wp speed. Super cache will be like your God. So for such users, we recommend this to install some basic caching on wp to make sure that it load their site faster or better. WP Super cache have too many issues and sometimes you may get locked out of your own site, so be careful and always have your backups ready to deploy in case such issues arises. Also backup .htaccess file. Our favorite is a 1st option above. Autoptimize is not essential, but if you want to improve further with plugins, we recommend it to be installed and properly configure it. 75% of the wp owners use shared web hosting to host their site or blog. There are three types of shared hosting providers are out there in Linux web hosting. And in Windows OS web hosting there are two types of shared hosting plans are there. Let’s discuss Linux web hosting providers. CPanel officially supports the following stacks. Some hosts mixup LAMP with varnish cache or Nginx web server as reverse proxy or frontend cache to upsell you a stack claiming it to be optimized for WordPress. The issue with LAMP stack is Apache is a slow web server. It has .htaccess and its overhead will make your requests to be served in a slow manner. Now the most ignored part of normal users is the type of storage. HDD: It is a normal storage type. Just like your spinning hard disk on your computer or old laptop. HDD spins and due to spinning storage type it is more porne to damages, slow read and writes speeds and slow performance when dealing with multiple files. SSD: It is a solid state drive, there is no read or write head. It is high reliable, faster than HDD, offers the best read and write speeds and improves overall IO performance. Storage: HDD and LAMP stack with CPanel. Storage: HDD and LAMP + Nginx cache with CPanel, very few. As an average user, you do not know or bother about the importance of hosting and its role played in a performance of your WordPress website or blog. You will ignore performance hosting and then later keep on finding new hosts or end up wasting time and money. If you check the official WordPress hosting requirements page, you can see that PHP 7 is recommended with MariaDB as a database server. Nginx is recommended web server for fastest performance possible. Unfortunately, CPanel does not support Nginx stack that is LEMP (Linux, Nginx, MySQL / Maria DB and PHP). So the high-end configuration with CPanel is not possible at the moment. So when your purchase average web hosting company, you will get LAMP based CPanel and HDD storage which does not speed up your WP or perform in an optimal manner. The solution for shared hosting users is to switch to Litespeed web server based web hosting. Litespeed is a web server that offers the same compatibility as Apache but performance is as good as Nginx. It is a hybrid stack. Not many hosts provide it, as Litespeed is a commercial web server. We at Rank My Hub offer LiteSpeed web hosting along with CPanel to give you the best WordPress web hosting. In the shared web hosting industry, we are offering the best stack with following features at an affordable pricing. Custom LAMP (Litespeed, MariaDB, PHP) based CPanel. Best possible stack. PHP 7 and multiple PHP versions with extensions can be enabled on the fly. HTTP2 enabled hosting for the highest performance possible. Litespeed has inbuilt caching to ensure that every bit of the websites hosted will take advantage of performance benefits to a maximum extent. Apart from all of these, we support LetsEncrypt SSL installation. It makes sure that all your WP instances are encrypted on the web. Take a look at our Web Hosting India plans and The Web Hosting plans for international customers. Check out the Litespeed web server benchmark for WordPress site here: https://www.litespeedtech.com/benchmarks/wordpress Litespeed web server is a clear winner with CPanel. 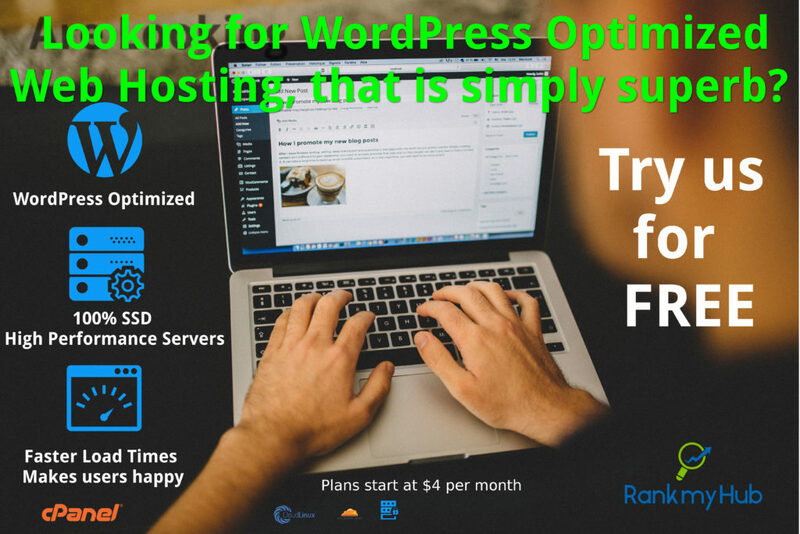 You can try our WordPress optimized web hosting for FREE for 30 days and decide. Apart from shared hosting other popular types of hosting types used by WP users are VPS, Dedicated and Cloud hosting. We will cover these in our next edition of WordPress Speed Optimization. You can accelerate your site or blog by setting up a content delivery network. Most people confuse that CDN means CloudFlare, though CloudFlare is one kind of content delivery network. It does not provide static file hosting, CSS, Js, and images hosting. It just accelerates the website by using Nginx as a front end cache server. To get true benefits of CDN, signup with a provider that hosts your assets, delivers from multiple locations on the earth based on optimal route, caches and optimizes the assets delivery, offers SSL support by default. And other features like load balancing, video streaming, picture optimization and much more depending on the provider. CDN is the last part of the speed optimization techniques for WordPress. If your budget allows and if you have a website that needs to be highly available and able to serve more concurrent users without a lag. CDN will add some advantage along with optimization and server. We hope this how-to article or guide is helpful to you. Let us know your feedback in the comments below. Thank you for reading. Share it and help people.